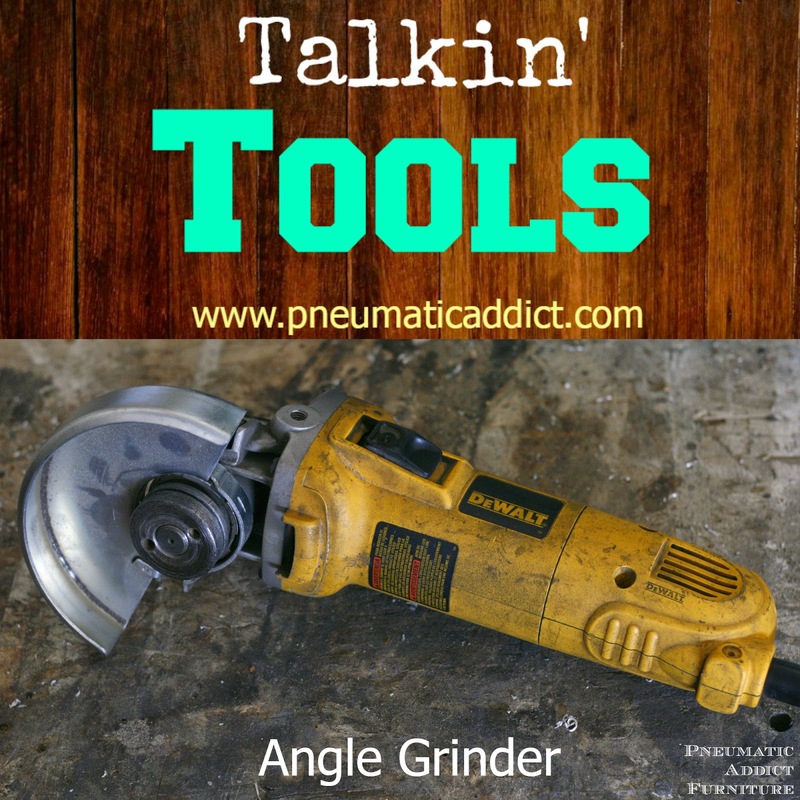 Man, its been a while since I've written a "Talkin' Tools" post. To find my other tutorials, click the "Talkin' Tools" tab. After sharing how to build an Easy Industrial Coffee Table last week, I realized I need to explain grinders a little more but first, I want to announce the winner of the Finish Max Pro giveaway. Congrats Sherry F.! I know you will love using your new paint sprayer. Thank you to HomeRight for the awesome product and thanks to everyone who entered! Now, turning our attention back to the shop. I bet a lot of you haven't ever used a grinding tool before. I'll be honest, if my husband hadn't pushed me into it, I probably would have been slow to warm up to a grinder. Its not the first tool you think of when you start wood working but I promise, it is one of the most useful tools you will every use. Let me break it down a bit. This is my our bench grinder. 6", 1/2 horsepower, bought used on Craigslist. I think it was a whopping $15. 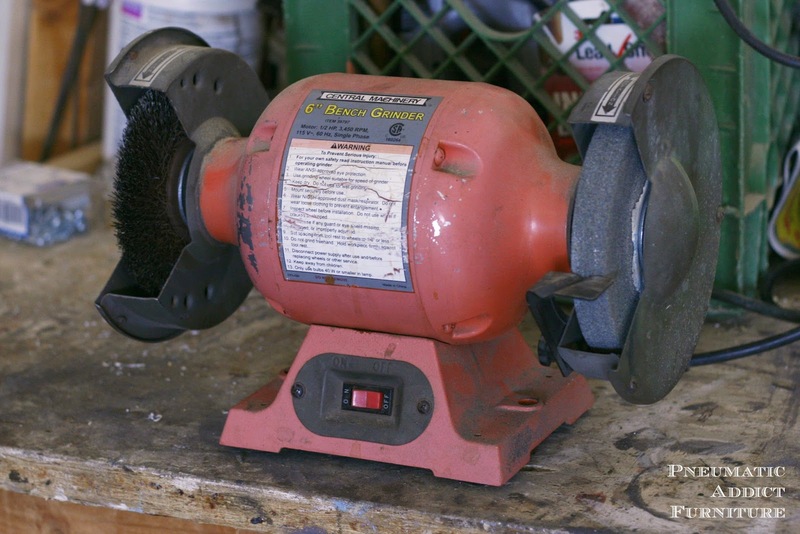 It is considered an entry-level bench grinder, is missing the shields and lamp, but it serves us well. 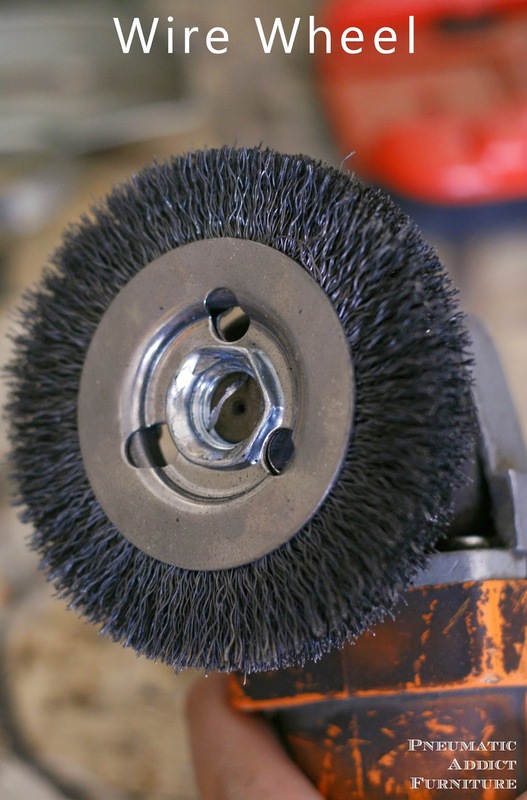 A bench grinder can have one or two wheels. Non-professional versions come in 5", 6" or 8" sizes. Horsepower can range from 1/3 hp up to 5 hp or more. At 1/2 hp, ours feels a little under powered. Common speeds vary from around 1750 to 3600 RPM. Lower speeds and horsepower models are great for cleaning off metal and even buffing. More powerful versions are often used to sharpen tools. I use ours to smooth down welds on smaller items or to clean off burrs from bolts I cut down. Its pretty handy. An angle grinder and is one of the greatest tools I've laid my hands on. You need to buy an angle grinder people. I'm partial to DeWalt (not paying me, just love their stuff). Common sizes for angle grinders in the U.S. include 4", 4.5", 5", 6", 7", 9" and 12". Unless you're a beast, you will probably never use larger than a 7" disk (even 7" is pretty intimidating). Depending on the brand and model, the arbor size (bolt in the middle that the disk attaches to) and RPM will vary. 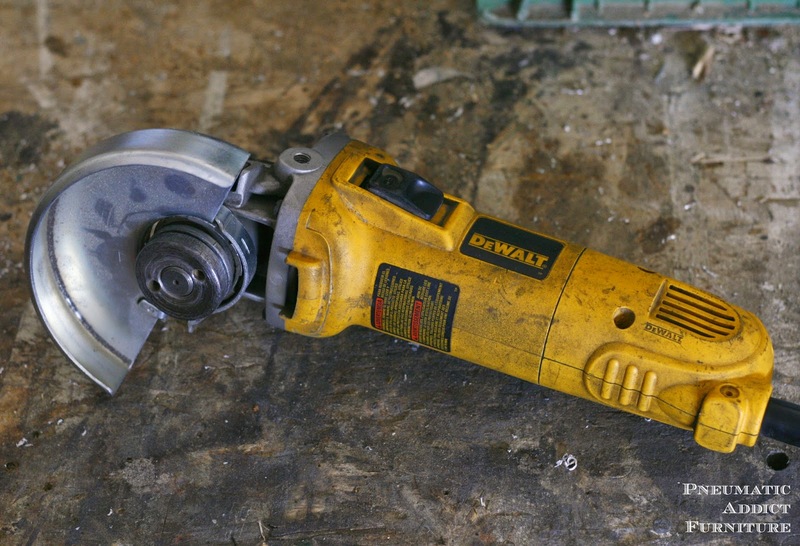 My *DeWalt angle grinder spins at 11,000 RPM and has an 10 AMP motor. We usually run 4.5" disks with it. My husband does some pretty serious welding and metal fabricating for his jeep, and this little grinder has been great! Plenty of power and easy to use. I have no idea where the extra handle is (they usually come with a perpendicular handle for extra control), and in full disclosure, we never use the shroud that protects the disk. My husband complains that it makes it too hard to use. Be safe. Do what I say, not what I do. Keep the shroud and handle on. While we're talking about it, lets mention the safety part. An angle grinder can be pretty dangerous if it gets out of control. When using an angle grinder, ALWAYS WEAR LEATHER GLOVES, HEARING PROTECTION, AND A FACE SHIELD! Also, make sure not to wear any loose clothing. When you start working with metal, it takes a little getting used to. 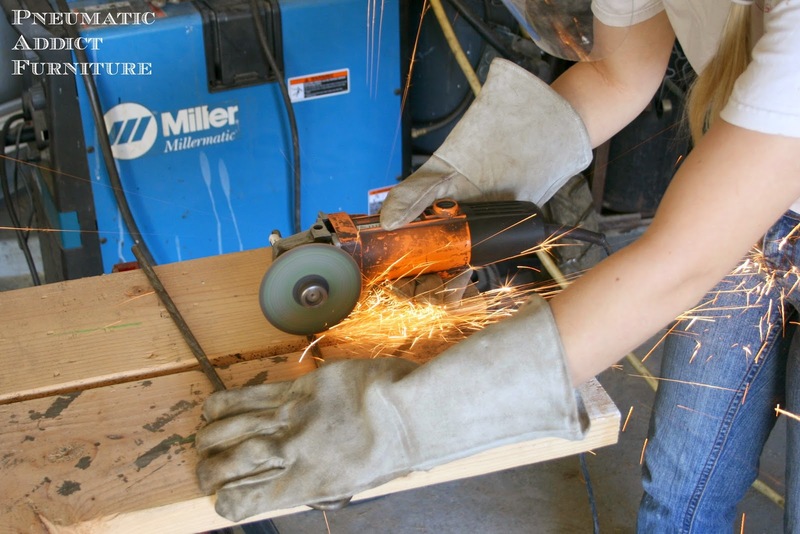 If cutting or grinding ferrous metals (steel or iron), you will get showered with hot sparks. They are usually harmless, but they can be irritating. Also, grinders will heat up the metal A LOT. Leather gloves are essential to not getting burned. Different brands have different processes to changing disks. We have a couple different angle grinders, One is a major pain to change out, requiring a large wrench, and the DeWalt one is a piece of cake. Simply press the button on the side, locking the arbor in place, unscrew the washer, replace the disk, tighten the washer, and tighten the disk. Make sure to read the manufacture's instructions. *Another "do as I say" moment. ALWAYS USE GLOVES WHEN REPLACING A DISK. So what can you do with an angle grinder? The better question is, what can't you do? The beauty of an angle grinder is that it is basically just s spinning, hand-held motor. There are dozens of different attachments for almost any job you can think of. Let me cover some of the most common. There are *wire wheels and wire cups. They both do the same type of job, but are better for different applications. It can clean/polish steel, create decorative brush strokes on aluminum, and I use it to age wood by bringing out the grain. 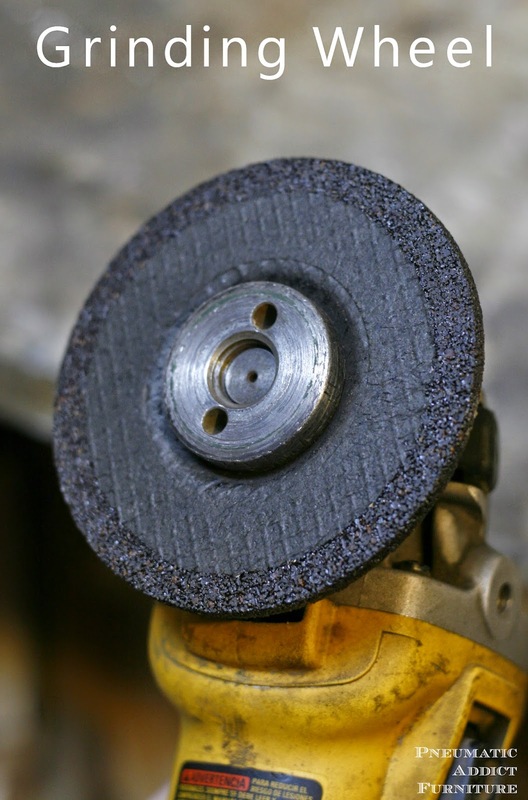 There are different grinding wheels for different materials. 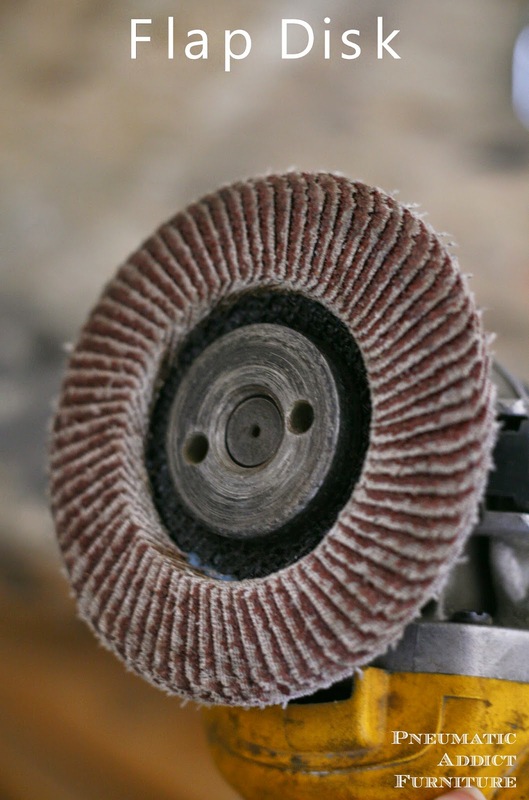 This is a photo of a *metal grinding wheel . 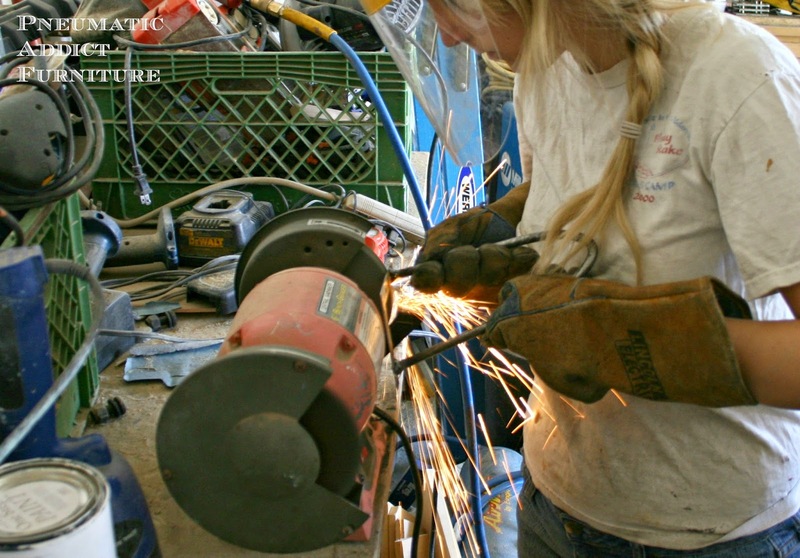 A grinding wheel is essential to welding and metal work. Its like sandpaper to a miter saw. It is used to smooth edges, grind down raised areas or bulges, or even to sharpen an edge. It creates a lot of sparks, but gives you a lot of control. 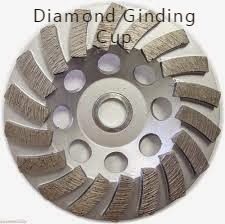 Similar to a grinding disk is a *grinding cup . They are often used to grind masonry. I recommend using one with diamond grit. It can be used to smooth edges or uneven spots in stone, masonry, and concrete. *Flap Disks are great! They are basically small strips of sandpaper attached to a wheel. They are like an electric sander on steroids. They can be used for metal or wood. Just be careful because they can remove material VERY quickly. I also use flap disks to age and distress wood. This is how you cut metal down to size. I talk about using a cut-off wheel when building both my World Market Knock-off table and my Easy Industrial Coffee Table. Metal cut-off blades are really cheap. I would HIGHLY suggest using the protective shroud with a cut-off wheel in particular. 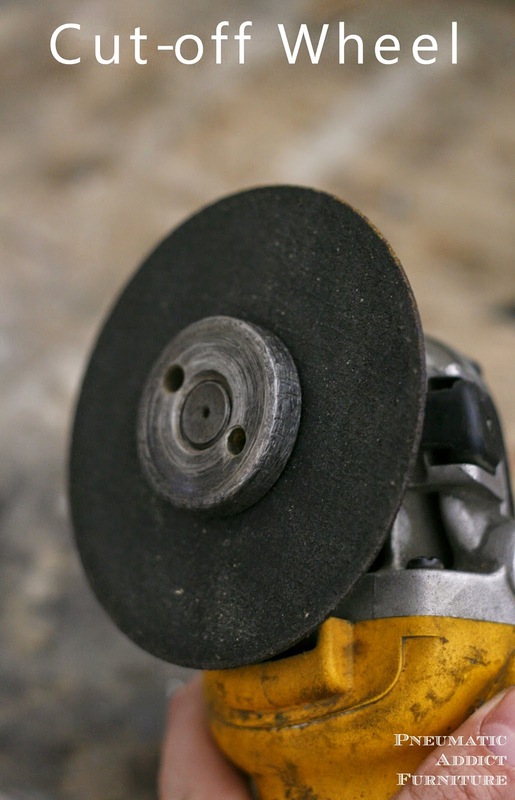 Make sure to not flex the blade when using an abrasive wheel. If flexed too much or hit with a sudden impact, the blade can shatter. Are you ready to buy an *angle grinder !? It may be a little scary in the beginning, but a lot of tools are. Practice using it on some scrap wood and metal to get the feel for it. Never cut towards yourself and always orient the blade on the material so the rotation would pull the blade away from you. Stand to the side of whatever you are grinding, when possible. I promise, an angle grinder will be one of the most useful additions to your shop. Thank you for this! I bought an angle grinder last summer but was so intimidated to use it myself that I made my neighbour cut the metal for me!! Time to buck up and try it out myself LOL! Hey, 11,000 RPMs can be intimidating! Make sure you have all the proper safety gear and start practicing on some scrap. You got this! I bought an inexpensive one from HF and love it! I will probably upgrade to a better one someday, but for now it does the job. I told my husband that the more I play with tools, the more impressed I am with men's ingenuity ... no matter what I want to do related to diy, it seems there's a cool tool to make it easier, lol. Good ole' Harbor Freight. I love that place more than Christmas! Power tools make life SO much easier! Thank you! I love my angle grinder. Aren't they so handy for cutting little tiles?! Yes, definitely pick yourself up some gloves and make sure you protect those eyes and ears! Thanks for sharing this angle grinder tools Elisha. I also like your writing style and how you express your ideas. 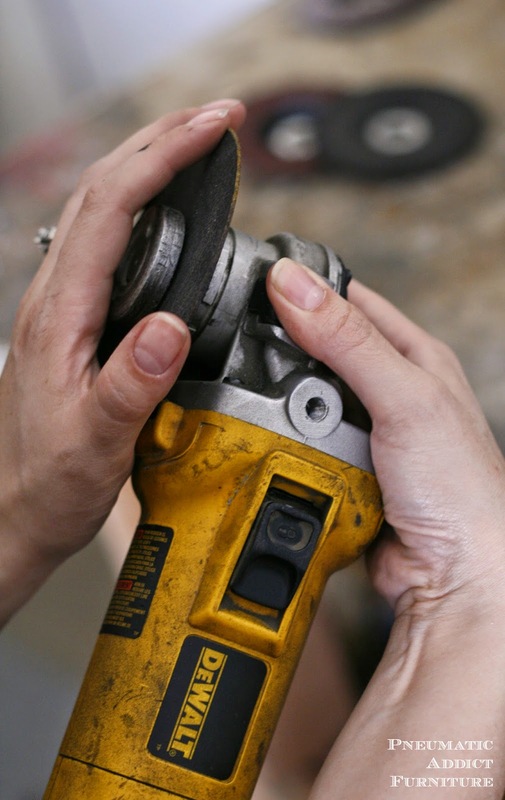 Really nice post for angle grinder user especially who are beginner.